Let me tell you a story that I’m sure will bring a warm, fuzzy feeling to your heart on this chilly Friday afternoon. 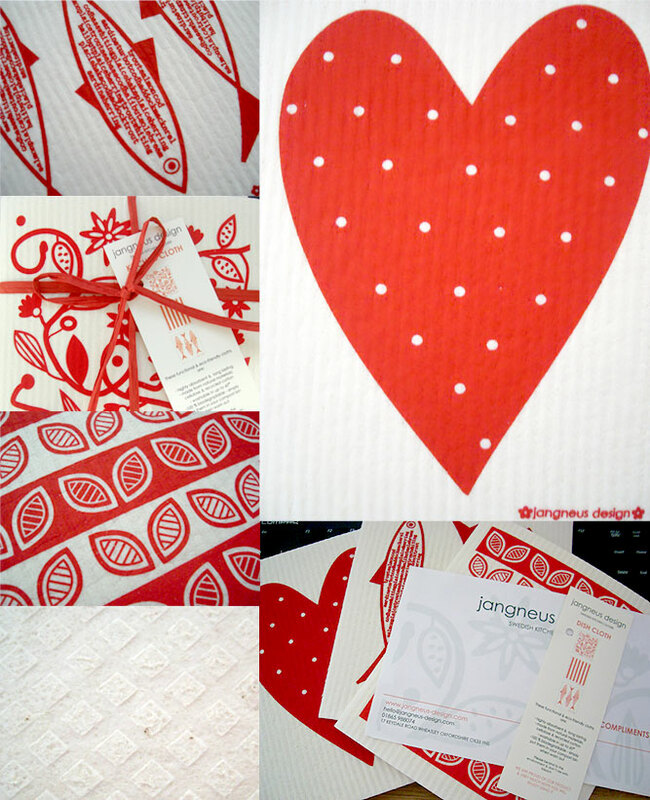 A few weeks ago I received an e-mail from designer Marie Jangneus-Davis recommending a product I might be interested in – a selection of eco-friendly, biodegradable, 60° washable kitchen cloths designed in Sweden and printed in Oxfordshire. At Red Candy we receive myriad speculative e-mails from hopeful companies wondering if we would stock their latest doodad that they happen to be producing in red, so I’m used sifting quickly through much of what reaches our sales and marketing inbox. For some reason though, this pitch caught my attention. 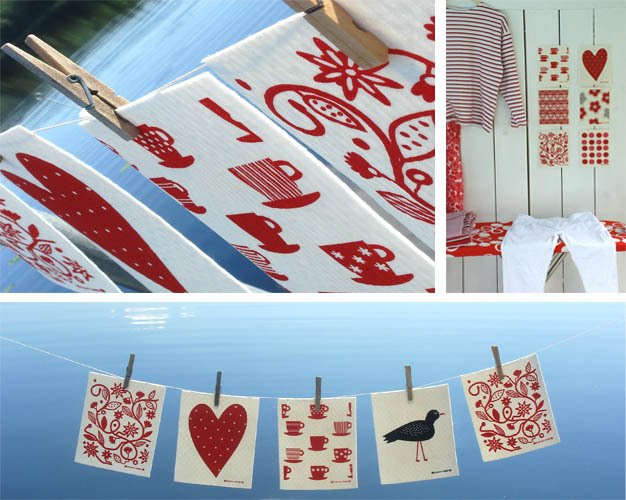 Perhaps it was the idea of Swedish design being combined with the quintessential ‘Britishness’ of a printing press clattering away somewhere in Oxfordshire, or maybe it was my soft spot for small, creative businesses and wanting to see them succeed. Whatever it was, I decided to read through in a little more depth and peruse her website http://www.jangneus-design.com. I was so impressed by what I saw, I decided run the idea past a few of my colleagues who agreed the cloths would make a wonderful addition to our range of products. Two weeks (and a little business talk) later, we received our first batch of cloths at our warehouse and began preparations for getting them onto the Red Candy website for sale. I hope she won’t mind me saying this, but Marie was a joy to work with. Which is why I was especially pleased for her when I heard she would be appearing on an episode of Show Me The Money on the BBC News channel this Sunday just gone. I was lucky enough to find the episode on BBC iPlayer on that Monday morning I watched transfixed as I saw all the lovely cloths in different colours on the screen. She’s real! – I thought to myself. Thankfully, the cloths are very much real too, and I can tell you they do a wonderful job of keeping our office kitchen area sparkling. 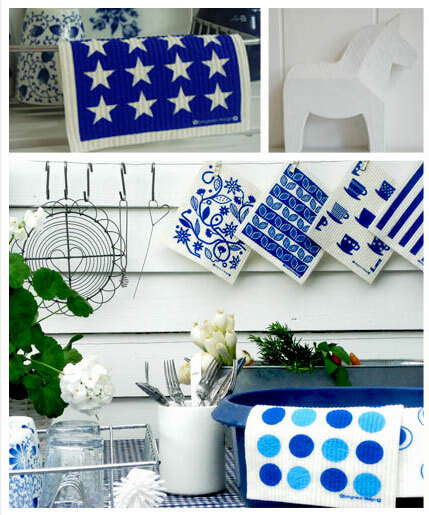 If you’re interested in buying cloths in different colours other than red, Marie provides a vibrant selection of colours including green, blue, turquoise, yellow and purple to match virtually any kitchen. She also provides a subscription service (http://www.jangneus-design.com/subscribe.php) which means you can have new cloths sent to you every month so you will always have fresh cloths to hand. Marvellous! 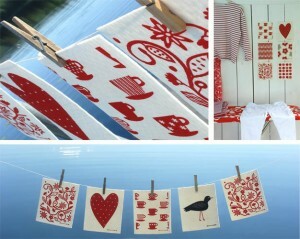 You can buy the red cloths from Red Candy here: Red Designer Kitchen Cloths. That’s all from the Big Red Blog for now. Yes, Marie is a delight to work with, she is such a nice person and yes, she is real! 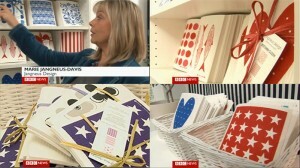 We have a high end shop here in Ontario Canada and we started to sell her dish cloths in November 2010. People just love the cloths and they tell their friends and the friends tell their friends and so on…. about these excellent cloths…Canadians are so happy to have this product available here.